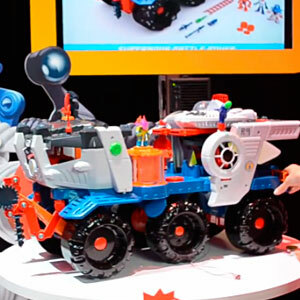 Our editors have searched the toy fair 2014 for the best new toys for kids—check out their favorites. 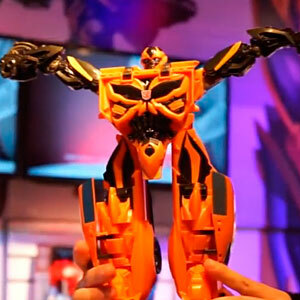 At Toy Fair 2014, we got a sneak peak at all of the hottest toys for the holidays. More than 1000 exhibitors from 100 countries showed off toys. The event is like the biggest toy store you could imagine. 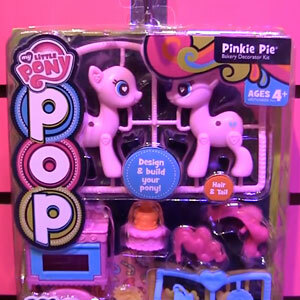 At the Toy Fair, TIA experts revealed the six biggest toy trends of 2014. 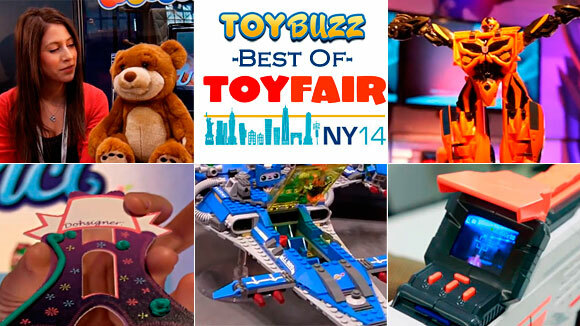 We decided to hand out our best of toy fair 2014 awards in each category. Let’s go have some fun. 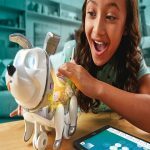 More and more educational toys are aimed at teaching kids Science, Technology, Engineering, Art and Math (STEAM). We saw everything from cool robots to fun scientific kits. Here are the best toys we saw for your budding engineers. For ages 5+ , MSRP $59.99 What do you get when you cross a Teddy Bear with a smart device? The smartest teddy bear ever. This cuddly teddy bear can answer questions, start conversations, and even tell jokes. Seriously, it’s like something out of a science fiction movie. It’s brain is actually your Smartphone. To communicate, it connects to a smart device via Bluetooth, searching Wikipedia and the web. Even though just a prototype was available at Toy Fair it was eerily realistic, saying things like “I am a super intelligent robot.” Hopefully, the kids won’t ask him to do their homework. You’ve probably seen the crazy science experiments carried out on YouTube like the exploding Diet Coke geyser. 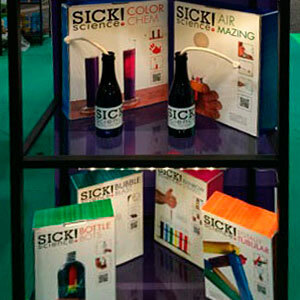 Now science teacher, Steve Spangler, has managed to capture the essence of his fun science experiments in a brand line by Be Amazing Toys called Sick Science. Sets include everything from wacky physics to stunning chemistry experiments. These sets make science fun. One experiment involved adding water to a powdery white substance. Moments later it erupted into a snow like consistency. That’s sick! 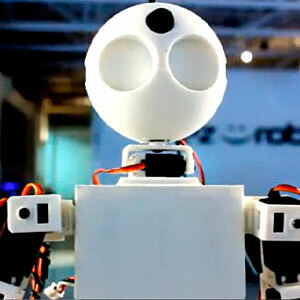 EZ Robot is trying to make robotics accessible to everyone. Robots are created using modular components called EZ-bits, which clip into place. There are three kits which vary in difficult from the simplest land rover to a fully upright 2 legged humanoid. The software includes an app store for community created apps. With the software you can make your robot have vision tracking, color tracking, voice tracking, and more. Take the wonderful idea of snapping together electric circuits with magnets to make circuits and combine it with music and you get The Little Bits Synth Kit. 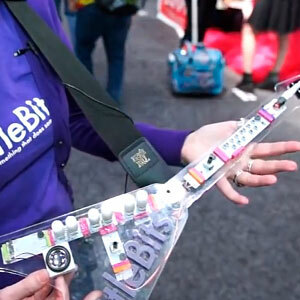 With the help of Korg, Littlebits developed this 12 piece set that comes with 2 oscillators, a delay unit, and a speaker. Snap the pieces together to create you very own synthesizer. The Moss Robotics Basic Kit system allows kids to snap together their very own robots out of blocks. Each block has tiny steel ball magnets on the corners that allow the pieces to snap together in a variety of ways. Depending how you attach the pieces you can easily create ball joints or hinges. There’s no programming required. 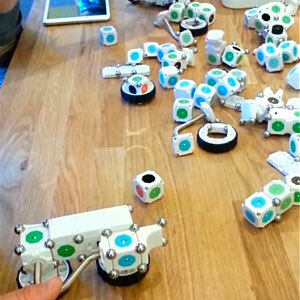 Each cube is already pre-programmed with sensors, input, output, power, and more. Put them together in anyway and you get your very own tiny robot. What if you could invent something? 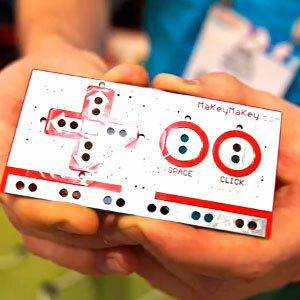 Makey Makey lets you do just that. It comes with a simple circuit board that allows you to create your own user interface for the software on your computer. It does this by mapping the keyboard button presses to anything that will conduct electricity. At the Toy Fair 2014, the company connected the board to bananas to create a banana piano. The only limit is your imagination. We want to make a Nintendo controller out of play-dough. 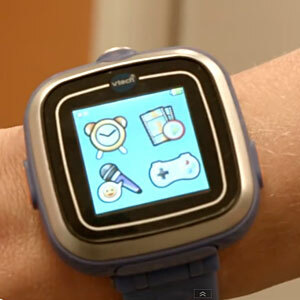 VTech is making the first ever smart watch for kids. It’s very easy to use with just two buttons. It’s got some cool built in features to keep the kids occupied. There’s a voice recorder, stop watch, and games. It’s got a built in rechargeable battery. Little James Bonds will have a lot of fun with the tiny built in camera. Here’s a game that actually teaches the basics of programming to preschoolers. The game is simple to play. The child is the programmer and the parent is the computer. 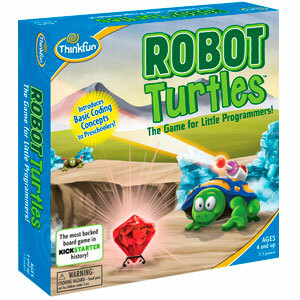 We love how kids get to choose between four cute turtles to represent themselves. It really makes the game more fun. The turtle and jewel are placed at different places on the board. The idea is to get the turtle to the jewel by drawing cards with instructions on them. Your preschooler may learn to program before they can read. MiP stands for Motion Inverted Pendulum. It looks like something from the future balancing on its wheels much like a Segway. It’s got a ton of different modes that are accessed by spinning its wheel. Each color on his chest represents a different game. One mode allowed you to control him using only hand gestures. He can actually detect objects in front of him, which causes him to reverse direction. Stack Mode allows MiP to carry objects on his little tray. He can actually hold up to his own body weight. You can even teach the little guy to perform up to 200 commands in succession. This is like an intelligent game board piece. 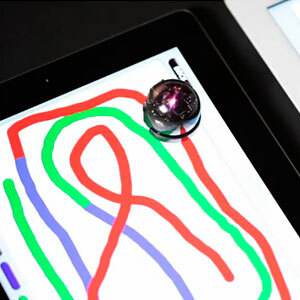 Amazingly, this unique robot can actually follow along over a line either on paper or on a tablet screen. It’s kind of unreal to see in action. You can create interesting or strategic tracks for it to race along. To make things interesting, it can actually recognize different colors on the track, causing it to speed up or slow down. Larger than life toys are none other than humongous toys. You know the type. The ones that are hard to hold with two hands. Here are larger than life toys that will make you say “WHOA” when you see them wrapped in a box. Giant aliens! Cosmic chaos! A giant truck to defend the planet. It’s the latest in the Imaginext line. The sheer size of this vehicle is impressive. It’s a beast. On the front, there is a retractable door that launches a moon rover vehicle. Sound the alarms the aliens are here. Use the crane to pick up an alien and lock it in the chamber. Lift off with the spaceship. With hundreds of sound effects and phrases, it’s a vehicle that is truly out of this world. This huge Thomas train track is so large that it manages to capture the entire adventure of the new Thomas movie called Tale Of The Brave. 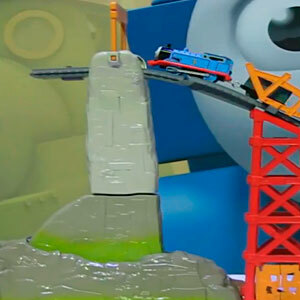 As Thomas chugs his way up a ramp there is a huge gap in the track. It appears that Thomas is going to fall off the track and go splat. Just then the entire portion of the track pivots, carrying Thomas safely across the track. Thomas accelerates down the ramp on the other side. It’s a really cool mechanic. As Thomas makes his way across the rest of the track he resets the mechanism and picks up a dinosaur fossil from the cave. For boys, what’s more fun than a large truck that wrecks things? 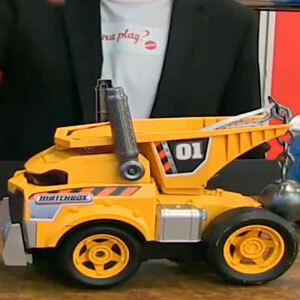 Wreckie is a giant demolition truck with a giant fun personality. He says things like “I’m here to help.” Boys will love his sense of humor as he passes gas saying, “I must have got some bad gas.” He’ll spin around bobbing his wrecking ball around, knocking everything over and then saying “Whoa the room is still spinning”. What a huge wreck! 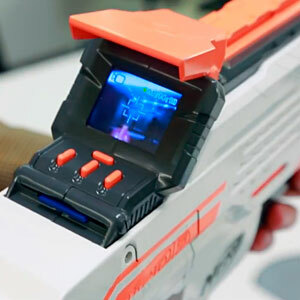 Not only is this a large Nerf blaster, it has a built in camera to record your missions. You can play the video right back on the blaster and watch it on the LCD screen. You can also share your favorite videos with your friends by removing the included 4GB memory card and putting it in your computer. It records up to 3 hours of video and fires up to 90 feet away. It adds a fun social element to traditional Nerf play. Mario Kart is probably the best multi-player game ever. Now kids under 70 pounds can experience larger-than-life thrills in a life-size Mario Kart Ride-On go-kart. 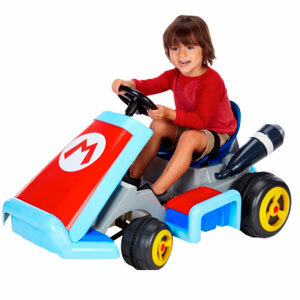 The Mario Kart Ride-On vehicle is battery-powered, rechargeable, and it even features realistic sound effects from the Mario Kart games. The only thing that’s missing is the ability to shoot turtles though we suppose that kids might start throwing banana peels around. 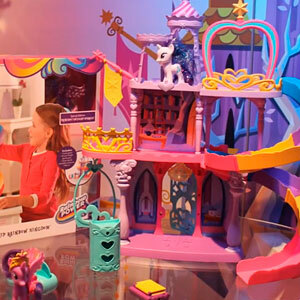 For 3 year olds, this My Little Pony Kingdom will feel like a castle. There’s all sorts of fun secrets to unlock using the friendship keys. Girls can unlock the vanity, wardrobe drawer, and treasure chest. It comes with a special version of Princess Twilight Sparkle. There’s even a rolling cloud car that slides down the slide. We love construction toys because they inspire creativity. At Lego, everything is awesome. Seriously, there are so many great sets for just about everyone. Beyond construction, we are seeing toys in other categories embrace this level of personalization. Here are some of our favorites. When we saw Benny’s Spaceship, Spaceship, SPACESHIP! at Toy Fair 2014, we wanted to take it home. It came as a complete surprise. 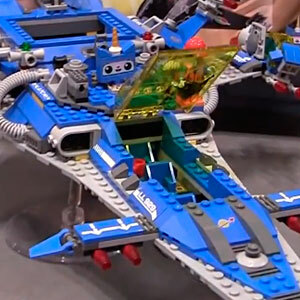 This retro spaceship looks just like the one in the movie and those classic spaceship sets that we used to build as kids. Based on the success of the movie, we think a lot of kids are going to want to own this after seeing the movie. Lego Juniors is a line of Legos for kids who have outgrown the Duplo sets but not quite ready for the larger sets. Unlike Lego Duplo, it contains regular sized Lego bricks. 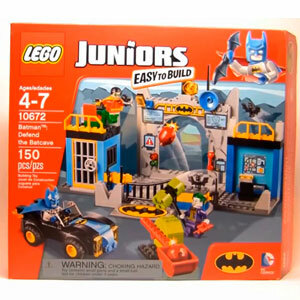 The line contains sets for both boys and girls who are 4 – 7 such as the Lego Junior: Defend The Bat Cave and Pony Farm. There are other sets that contain superheroes and princesses. This is too cute. Girls have fallen in love with Lego Friends. Our gals are taking a vacation from Heart Lake City and headed for an adventure in the jungle. It’s up to the Lego Friends to rescue any animals in danger. Who could resist these cute animals? It has so many of our favorite animals including a monkey and even a panda. There’s a watch tower to keep an eye on the animals and a fun little zip line to zip down in case any of the animals are in danger. There’s even a slide that allows one of the Friends to hop into a rescue boat. Like other sets in the line, there are so many opportunities for rich storytelling. 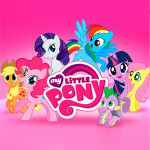 Here’s something completely new from My Little Pony. Girls can pop the ponies out of the frames and snap them together. Then the fun begins. Girls can decorate their ponies with different hairstyles, wings, outfits, or tails. It’s all up to their imagination and self expression as every pony will look different. What will “pop” into their head? 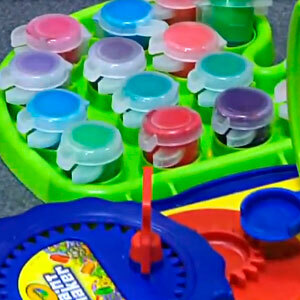 Now kids can mix up their very own washable paints with the Crayola Paint Maker. Kids can make just about any color either following the instructions or by experimenting. First ,you take the base paint and add it to one of the 15 included tiny paint cans. Then add the appropriate color strips to it, shutting the lid. Then the fun starts. Give the machine a spin to shake up the paint just like in any home improvement store. Hopefully, kids don’t use the paint to paint the walls. Hasbro has created a wonderful new compound that allows kids to decorate all kinds of surfaces. Kids simply load one of the 12 colors in the glue like gun and easily squirt the substance out on just about any surface from glass to even pumpkins. Unlike Play Doh, the compound doesn’t crack as it hardens over night. Hasbro plans to release a number of sets in the line. Be careful your kids will soon become Dohsigners. What do you get when you take your favorite super hero characters and mash them all together? 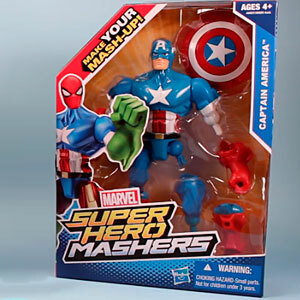 Marvel Super Hero Mashers. We used to this all the time with our broken toys. Now Hasbro has created a toy around this idea. You can take their body components apart and mix and mash them together. Put Hulk’s head on Captain America’s body with spider Man’s leg. Some combinations can be hysterical. Even with two figures, the mix and mashing is tons of fun. RC Vehicles are now being equipped with more innovative features such as the ability to launch things. Here are some of the most unique remote controlled toys we found. This remote-controlled spider looking vehicle is meant to cause mayhem. I think every eight year old boy is going to want one of these RC Nerf combat creatures to chase people around the house. 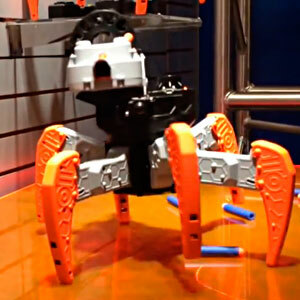 Not only can boys remote control this six legged creature around, it’s got an automatic Nerf blaster on it that can twist all the way around and pan up and down. Nobody is safe. Apparently, monsters are no longer scary. Gothic themed toys are all the rage these days. Here are our favorites toys. 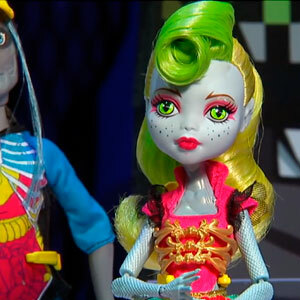 The Monster Freaky Fusion dolls are an interesting twist that will leave Monster High fans breathless. It’s based on a new movie. Frankie has jumped through a portal and every two of her friends that go through the portal get fused together. So there’s Clawdeen Venus, Cleo Toralei, Lagoona Fire, or Dracubecca. The dolls combine half the personality and look of one doll with the other. It’s a great way to mix things up. Classic toys are still popular and many retro toys are being retrofitted for the current generation. Here are some toys that brought back memories and are based on classical play patterns. Here’s a spin on the classic plush toy. 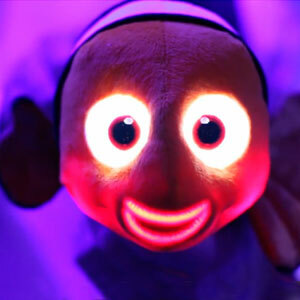 This adorably cute toy comes to life using animated LED lights for both the eyes and mouth. He’s still soft and huggable. When you see the face animated while the character is singing or talking, it looks like it jumped straight out of an animated film. Characters include everything from Batman to Doc McStuffins. These make great bedtime pals. Remember the fairy tales that we grew up with? These dolls are the sons and daughters of famous fairytale characters. 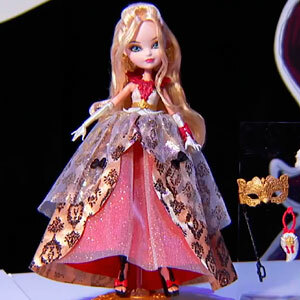 The line is by the same designers that created Monster High. The new line will be based on a new special that will air on Nickelodeon in the fall. What’s more exciting that home coming? Throne Coming! During the special, girls will have a chance to vote for their favorite Queen. It’s such a great idea. There are 2 royals and 2 rebels- Blondie, Apple, Raven, and Cupid. Each of their gowns looks gorgeous. Too bad we can’t vote for all of them. Girls have always loved dolls based on their favorite cartoon movies. In our day, it was Pocahontas and Mulan. Now every girl has fallen in love with Disney Frozen. 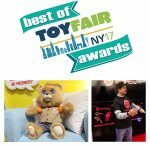 At Toy Fair, the toy line has finally been revealed. We are so excited for it. Now fans can relive the scene where Elsa magically creates an ice skating rink as she skates with her sister, Anna. 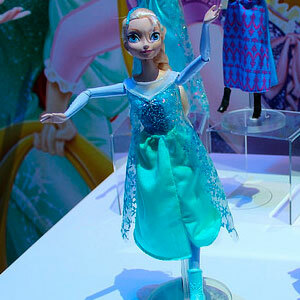 Both Elsa and her sister Anna will be available. When you move the doll back and forth, the doll will lean forward and back as it skates around on one foot. My Little Pony has been around for awhile. In this line the ponies have been transformed into humans. Not only do these dolls rock, give these dolls a high five and they actually talk and sing. You can even make them high five each other and they sing together. Whoa, so cool! 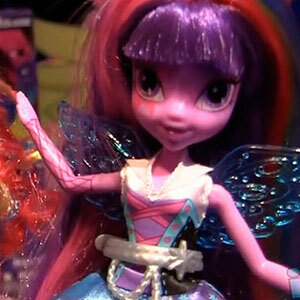 Pinkie Pie, Twilight Sparkle, Adagio Dazzle will be available in this line. You can give these dolls a high five this Spring. We grew up with Transformers. With a new Transformers movie coming out, Hasbro has an entire new line of Transformers to go along with the new movie. The Dinobots look super cool. They still have their line of sophisticated Transformers for collectors and older kids. However, younger kids often want easier transformations. For them, Hasbro has created the Robots In Disguise line. In the line, we love the Mega One Step Bumblebee and Stomp N Chomp Grimlock. Bumblebee converts from a sports car into robot in a blink of an eye. You simply pull apart the two legs from the rear of the bumper and out pops the figure. It’s really like Transformers magic. For every generation, there is always a new Elmo toy. Will this be the next Tickle Me Elmo? Inspired by the Elmo The Musical segment on Sesame Street, Elmo can change his personality when kids change his hat. Put a crown on him and Elmo comes to life playing Prince Elmo says. 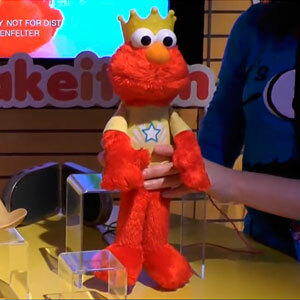 Elmo will ask kids to perform different activities like bouncing him or rubbing his tummy. The little cartoony sound effects make things even more fun. Throw a cowboy hat on Elmo and Elmo helps kids count up to 20. Then put a captain hat on Elmo and help Elmo identify ocean sound effects. I love the Modular Robotics Kit. If I were a kid this is what I would want. Looks like a lot of fun.